So while this idea has been percolating in my brain for the past five months, I’ve come across more articles and videos that either back up this idea or have given me more clues to the final product. I realize this is quite the dump (who do you think wrote the article, by hand? ), but you can safely skip to “The Challenge” section below. Having said that, you’ll be missing all the fun. The fundamentals of Game Design explains how all games are actually a series of mini-games, and one must carefully craft those mini-games in order to make a successful game. It then goes on to cover what the elements of a mini-game are and how to build them. In Gaming can make a better world , Jane McGonigal explains what the billions of hours spent on video games are creating. If it takes 10,000 hours to be a master at something, and many people have obtained that in video games, what are they masters in? Urgent Optimism: The desire to act immediately to tackle an obstacle, combined with a reasonable hope of success. So what do these things make? Super-Empowered Hopeful Individuals. They believe as individuals they can change the world, but in online worlds. Hmm, can we find a way to capture this? The online Urgent Evoke game was one of the three games showcased in the above video. Peek around to see what’s possible. Tom Chatfield talks about 7 ways games reward the brain explores how games have found compelling ways to keep us engaged. He explains techniques that are currently used, many of which we should be mindful of for this project. Now this Big Game is bound to start through guerrilla marketing. How to make a splash in social media [Video 4:27] from Alexis Ohanian of Reddit, explores meme creation, and the lesson of losing control. Word of Mouse explores 10 ways to master nonprofit guerrilla marketing through social media. If we want to maximize our results, very important lessons to learn. Design Outside the Box by Carnegie Mellon University Professor Jesse Schell humourously delves into the addictive psychological tricks employed in casual games. He then moves onto explore a world where we receive points for everyday actions (the technology in the game over the game in technology as explored above) which would slowly change our behaviours as those certain actions are rewarded. Lots of wonderful game elements to learn from this. Now unfortunately I haven’t actually finished this video because of my internet connection (don’t ask), but it’s only the last 5 minutes or so I’m missing. Which of course are where all the conclusions are. Sigh. So all of these elements are great, but won’t work unless we have a purpose. Natalie Jeremijenko and The art of the eco-mindshift explores some wonderful examples of small causes and quirky, fun ways to solve them. From planting mini gardens in the streets in front of fire hydrants (not in use normally, and oh boo woo a firetruck ran over a plant) to a grid of buoys that light up when fish swim below and the colour of the signal signifies the oxygen levels in the water, we can create works of art that change and inform our behaviours. Lastly, I have found Clay Shirky’s talk on institutions vs. collaboration quite helpful. He makes the case that institutions, basically any type of formal organization, is missing out on vast sums of potential, by it’s very nature of being an institution. If we wish to unlock as much potential as possible, we have to go down the path of more loose ties. One size does not fit all, and the same goes with volunteering. Fewffh. I realize that’s a lot to swallow, even with out clicking any links. So I’m going to summarize. I wish to build a Big Game, where by the public will be inspired by a purpose, and incentivized by the game mechanics to continue working on something of meaning, all while having a fun time. This will showcase, and increase society’s value of Scouting, creating buzz. I plan on using modern technology to create a game inside reality. There are already successful case studies such as Four Square, Geo Caching, and ARG’s. The next step from here is choosing a purpose. Scouting has to take a stand on an issue. That shows leadership, something we claim to teach. Something that aligns with the principles of Scouting, and that will capture the imagination of the public. Something I’ve come to realize is that whatever we choose, it can’t be completely selfish. An example for that would be more money / support for non-school based childhood education. Not going to fly. A better answer might be the reduction in paper usage and planting of more trees. We already do that with Scout Trees, and I’ve even heard from companies that join local Scouts to assist them on that day to plant trees. As you can see, there are quite a few green based answers, but by no stretch of the mind are the only types of answers. They are quite in vogue these days, and are scalable from small actions to larger ones. As food for thought, the three position statements of Scouts Canada are Leadership, Environmental Stewardship, and Healthy Active Living. Now how cool would it be if we set up a game that hands out points for different actions, and you attained levels as those points increased. Then when you get to your first level, you receive a badge in the mail! Not a bill, or a piece of junk advertising, just an envelope with a badge, and a simple thank you letter for attaining level one. Most people would be besides themselves in awe. Now these points can also be given out in combos. You have your team of six people (hmm, patrol sized…) all check in your behaviour at the same time? Congrats, you all get five times as many points! Then the next week you all attend an official event? Ten times the points! The trick here is encouraging verifiable actions. One person could check in fake actions. So could six, but less likely. If we punch it in for them, all the better for both sides. If during your travels across the internet that might help or be related to this idea, do let me know and pass it on to me. Good ideas come from merging other ideas together. So great. I have an idea. Ideas are free. Do you know why? There are so many of them. Infinite. Supply and demand dictates that anything with a supply of infinity will be rather cheap. It isn’t even a complete idea. So half of free is…. well still free. Your ideas for game elements, new or ones you’ve seen before. Your ideas for the purpose. What will society change? Your ideas for how this will start. The hardest part will be reaching the tipping point. If no one joins in, no one else will. The reverse can be overwhelmingly true. 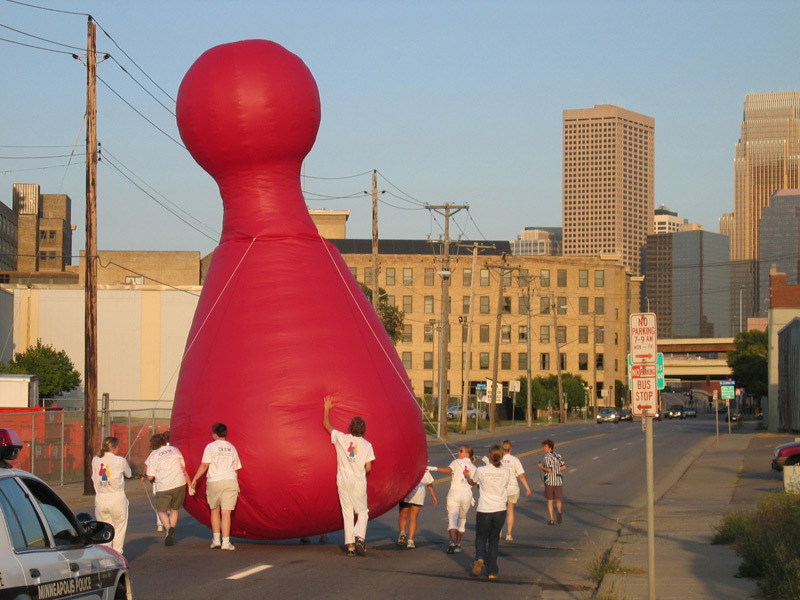 It doesn’t have to be a giant city wide game where 25 foot high game pieces move around based on the collective will of its citizens. It could grow to be that big, but it will never start there. I’m going to keep giving this idea some serious thought. I know the required inputs are high. Massive levels of planning, thinking and testing. Potentially recruiting ridiculous sums of people to work behind the scenes. An infinite number of ways this could get derailed or go sideways. Compare that to the possible outcomes. The Epic Win, if you will. Call me crazy if you’d like. I just think Scouting needs to Walk the Walk, and prove it’s worth. With that, I’m going to leave you with one last video[3:10]. This entry was posted in Fun and Games, Recruitment. Bookmark the permalink.